Make the asparagus and bacon dish of your dreams. 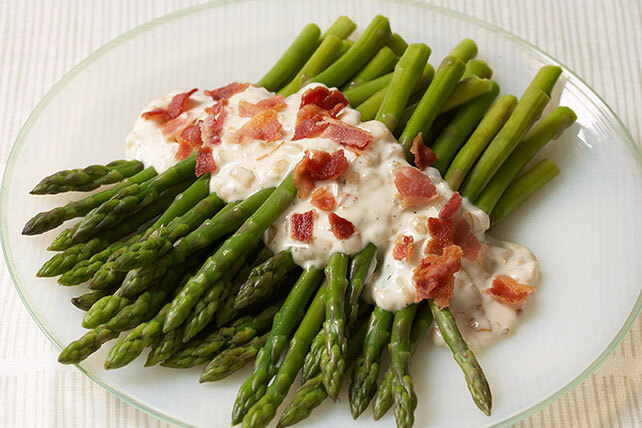 Asparagus and bacon with caramelized onions and a ranch dressing fits into an eating-well plan. Place asparagus in microwaveable casserole or 10x4-inch dish. Add water. Microwave on HIGH 4 to 5 min. or until asparagus is crisp-tender. Meanwhile, add onions to skillet; cook and stir 5 min. or until tender. Stir in dressing. Drain asparagus; top with sauce and crumbled bacon. Asparagus spears snap off naturally where they are tough. Simply bend the spear near the bottom end and it will break off at the right point. Or, remove an inch or so of the "woody" portion off the bottom of the stalks with a sharp knife.